hargreaves | "Name On The Trophy"
Sir Alex Ferguson, will have to take time off from showing FIFA dignitaries round Old Trafford and ignoring the BBC to pick his final 25 man Premier League squad this week. The deadline is the 31st August by which time Fergie needs to have chosen 25 players for his squad which will last until the transfer window re-opens in January. Eight of these players must have spent at least three years at an English or Welsh club three years prior to turning 21. The recent United reserve game against ‘Noisy Neighbours Kamikaze Spending’ XI highlighted the strength in-depth at the manager’s disposal. With the likes Wes Brown, Gary Neville, Anderson, Rafael Da Silva, Darron Gibson and Kiko Macheda all starting for the reserves it shows not only just how strong the United squad is but also how difficult it is going to be to keep everyone happy. Fortunately for Fergie, players under the age of 21 don’t count towards the 25 so it will make the United manager’s task a hell of a lot easier as of the new recruits this summer only Chicharito is over the age of 21, while many fringe members of the squad have yet to reach that milestone. The home grown rule will affect United a lot less than some other Premier League teams as the core of United’s squad is made up of English players. Rio Ferdinand, Wes Brown, Gary Neville, Michael Carrick, Paul Scholes, Michael Owen and Wayne Rooney are all obviously English, while Jonny Evans, John O’Shea, Darren Fletcher and Darron Gibson have been here for at least three years since before they turned 21. Oh and there’s also that welsh bloke who plays on the wing now and again. The fact is filling the home grown quota shouldn’t be a problem so the rumours of Mickey Phelan making a comeback to bolster the squad are totally unfounded. Due to players who aren’t ’21′ not needing to be registered it means the likes of Macheda- who bagged a brace for the reserves last night -Tom Cleverley- who grabbed the other goal- Rafael and Fabio Da Silva, Chris Smalling, Gabriel Obertan and Bebe can be brought in and out of United’s match day squad without any drama. 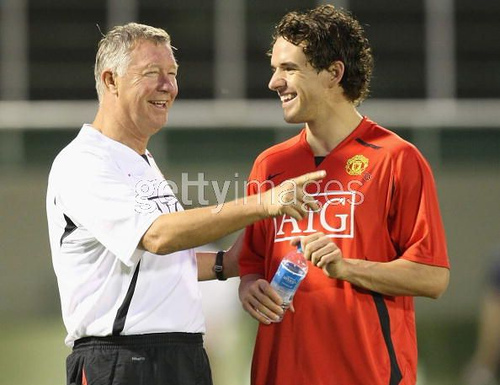 There is of course the question of Owen Hargreaves and whether Fergie will name the perpetually injured midfielder. The answer I believe is yes, simply because he can afford to. The fact that players who aren’t 21 when the season year starts, not the actual season itself, don’t need registering means that players who have turned 21 in the past few months, such as Obertan and Cleverley won’t count. That rule could be the one that saves Hargreaves’ United career, as it leaves space for him to be included. If Hargreaves is likely to return to ‘fitness’ anytime in the next few months there are still the doubts regarding how the player’s confidence has been affected by his ongoing injury saga, a point Fergie has raised in the past. With his contract due to expire in the summer, he may struggle to find a new deal at United, however at least for the time being he does still have a United future. By my reckoning United will actually only need to name a 24 man squad due to amount of youngsters they’ve got. Here’s the 24 men I believe will be named by Fergie next week. Wes Brown, Gary Neville, Rio Ferdinand, Nemanja Vidic, John O’Shea, Patrice Evra, Jonny Evans, Richie De Laet. Anderson, Michael Carrick, Paul Scholes, Ryan Giggs, Darren Fletcher, Nani, Antonio Valencia, Ji-Sung Park, Darron Gibson, Owen Hargreaves. Michael Owen, Wayne Rooney, Dimitar Berbatov, Javier Hernandez. Considering you can also add to that list the likes of Smalling, Fabio, Rafael, Obertan, Cleverley and Macheda then if injuries go United’s way there’s every reason to expect yet another title challenge this season. Time for Fergie to get tough with injury-prone trio? Can Hargreaves really be relied upon anymore? 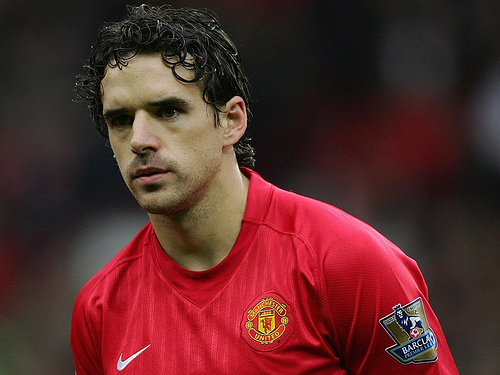 Owen Hargreaves’ latest injury set-back will have come as little surprise to many of the Old Trafford faithful. While there’s no denying the midfielder’s abitilty and the fact that when he’s fit, United look a much stronger team, after two seasons of inactivity, questions about his capacity to return to action only increase. Hargreaves has endured the sort of injury problems that must be every footballers worst nightmare. With severe tendonitis in both knees, Hargreaves underwent an operation which supposedly meant he’d miss pretty much all of the 2008/09 campaign. Yet more than one season on there still seems to be no real end in sight for his injury lay-off with him now expected to miss the start of the upcoming season. Sir Alex Ferguson has at times seemed to lose a little patience with Hargreaves, claiming in the latter part of last season that the reason the midfielder wasn’t ready for first-team action was due to lack of confidence rather than physical ailments. Then there were reports at the end of the season that Hargreaves had stormed out of training after Ferguson had told him he would not be figuring in the final game against Stoke City- thereby scuppering any slight chance he had of making the England World Cup squad. Hargreaves wasn’t the only English- sort of- United player who wouldn’t need to worry about the deafening noise of vuvuzelas this summer. Perennial injury victim Michael Owen, lost any slight chance he had of making the plane, when he limped out of the Carling Cup final. I for one was against the signing of Owen as I felt he wouldn’t last the season and his signing would prevent United pursuing a much needed striker. I have to confess following his derby day last-minute winner, I did change my mind slightly, but the doubts remained. Owen, like Hargreaves, when fully fit is world-class, of that there can be little doubt. His hat-trick away at Wolfsburg showed that he can still perform at the top level, however it wasn’t long before the injury demons reared their ugly head and he was back on the treatment table. Owen’s injury problems have been well documented for years now and no doubt helped contribute to the lack of interest in him when he was a free agent- causing the brochure debacle. Fergie obviously thought the striker still had a lot to offer and at one point looked like being proven right. Now though it seems Owen may find it even harder to get back in to the United side with Rooney, Berbatov not to mention Javier Hernandez plus Kiko Macheda, Mame Diuof and Danny Welbeck all fighting for positions. The question is will Fergie give Owen another chance- a real chance not just Carling Cup and seemingly easy Champion’s League games- to get into the starting XI? One player who’s place in the starting side is pretty much guaranteed- as long as he’s fit of course- is the part-time England Captain, Merker, Film Producer, Website Entrepeneur, Rio Ferdinand. I’m a big fan of Rio’s, but the startling reality is the former Leeds man hasn’t looked fully fit for almost two years now. Coming back from numerous injuries United’s sometime captain often looks a little out of sorts, whether its pace or concentration wise. Ferdinand like Owen and Hargreaves, is a truly world-class player when he’s fit, but like his two occasional England- and United for that matter- colleagues, he’s rarely fully fit. Last season he started less games than Ledley King and then there was the whole coming back from injury only to get banned in his first game back for elbowing Craig Fagan episode. The problem with Ferdinand is whenever he’s fit he comes back into the side more often than not for one or two games then is out again. This leaves Jonny Evans in and out of the team struggling to get the consistent run he both needs and deserves. The point I’m making about all three players is when is it time to admit defeat and move on? All three are around the 30 year mark, Ferdinand and Owen being the wrong side of it. With youngsters coming through or available in each of their positions, is it time for Fergie to give other players a chance and call time on the trio’s Old Trafford careers? This may sound harsh on all three, after all Hargreaves and Ferdinand were instrumental in helping United win the double in 2008, while Owen has only been given one season to prove himself. However, keeping changing the defence does nothing for stablility and isn’t going to help Evans develop a relationship with Vidic or gain the consistent run he needs. Players like Hernandez and Macheda are the future and should surely be given a crack of the whip sooner rather than later as it will probably only be as Rooney’s understudy anyway, so pushing them further down the pecking order to accomodate Owen seems slightly short-sighted. As for Hargreaves, while theres no denying the jury is still out on Anderson and Michael Carrick has actually gone backwards recently, can United afford to consider the Canadian-born midfielder a viable option? Is it not time to admit that he may never regain full fitness, or be the player he was two seasons ago and start looking at other options? While many United fans may disagree, after all who can forget what all three players have done for the team at certain times, with Chelsea looking strong, Arsenal keeping hold of Cesc Fabregas and Manchester City buying most of Europe, is it now time for United to start looking forwards, however hard that may seem.